The Happy Mondays reformation we reported a couple of weeks back is definitely on, the NME has confirmed. The band have announced an 11-leg reunion tour in May. 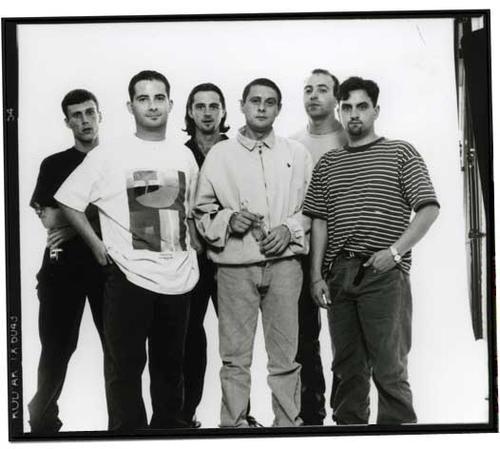 This will be the first time the band - which features singer Shaun Ryder, maraca shaker Bez, drummer Gaz Whelan, backing singer Rowetta Morgan, guitarist Mark Day, bassist Paul Ryder and keyboardist Paul Davis - will have played together since 1992. Rumours of a reunion first circulated last December, when it was mentioned that the band were set to reform for a full tour and an accompanying documentary for 2012. Shaun Ryder said that meetings had gone well and everyone was full of beans about the reunion. "We all met up last week and some of the lads haven't seen each other in over 10, 15 years. It's as if we've never been apart – so good to all be in the same room again. We can't wait now to get on tour and play the songs that made us famous." Backing singer Rowetta Satchell told the BBC: "We want to put on a really good show. We decided it would only be special and work if it was the total, original line-up. We're all really excited. They are my family these boys, I've really missed them and I'm sure they've missed each other." Satchell also suggested a support slot with The Stone Roses would be ideal, but that it would be up to Ian Brown and co to decide. She said: "It's up to the Roses. As long as we've not killed each other by then, we'd be up for it." They have reunited twice before, most recently in 2004, but without founding members Mark Day, Paul Davis, Rowetta Satchell and Paul Ryder.